Autumn's Elementary school has a program called the "Watch D.O.G.S.". It's motivation is to get Dad's into schools. Dads volunteer to spend an entire day in the school and get to know the students and spend time with their own kids. 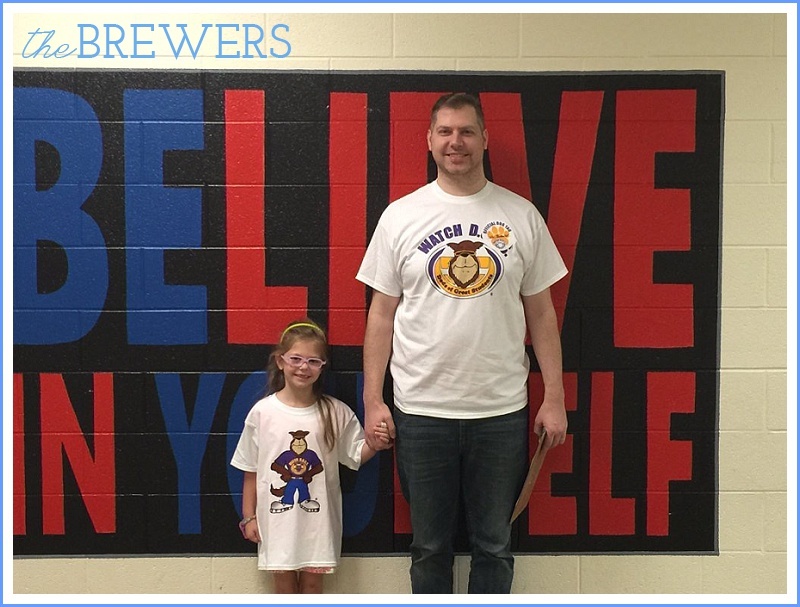 After seeing countless Watch Dogs come in throughout the year, Autumn asked if Adam could come in and be one too. Lucky for us, he obliged! After a few weeks (it books up quick!) their turn finally came. On his day, Adam got his special Watch Dog shirt and a matching one for Autumn. They get to be on the morning news together, announcing who the Watch Dog is that day, and their picture goes on Twitter and the school website. Adam gets an entire clipboard full of responsibilities for the day. Lunch is free and he got to eat with Autumn and spend time outside with her during recess. It really is a neat program. Autumn was so glad her Dad could come!